I carry around a list in my brain… a list of things that I’m in love with. Actively in love with, everyday… just walking around in the world. I’m in love with fresh ginger tea, jewels big and small, my perfect black cotton dress, girls with long wavy hair that I covet, day planners, mechanical pencils, and the smell of clean laundry. This is aside from loving the people and pets around me. This love is separate from family and friends. This love sometimes steps to the back of my mind and I’m left feeling a little blaaaaaahhh…. until all the love comes rushing back and I remember that I’m totally in love with my life. I mean… think about it. Despite its messes and disappointments… and bills, there’s a lot to be in love with… even if it’s just the smell of your new shampoo, because it reminds you of toasted coconut. 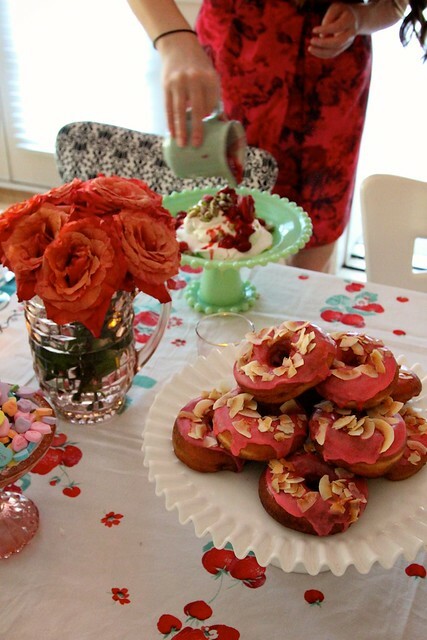 I made these pretty pink doughnuts, and shared them with friends. I decided that this Valentine’s Day… it’s important to be in love with life. I don’t even care how cheesy that sounds… because it feels good, and tastes bonkers awesome. 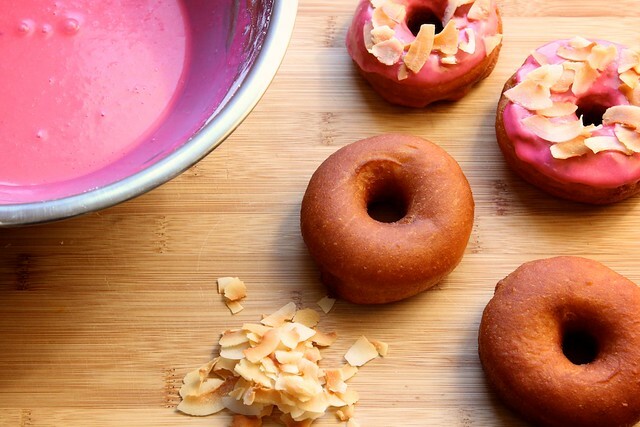 These doughnuts are made with two important ingredients. Vegetable shortening… which acts as our internal fat in the doughnuts. Vegetable shortening is a different fat than butter. Butter has water in it, which can make the doughnuts crack a bit during frying. Vegetable shortening is a fat without water, so the doughnuts will be smoother. Feel free to use butter, but the doughnuts may have a slightly different appearance. This doughnut mixture is mixed in an electric stand mixer with a paddle attachment before it’s mixed and kneaded with a dough hook. Yes… I said mixed a lot of times in the above sentence. Deal. After a bit of time in the mixer, the dough will be slightly tacky, but not stick to your fingers or the bowl. It will feel soft and pliable… but with a bit of weight to it. Lovely dough before the rise. Dough gets risen in an off oven with a warm water bath. It’s like an at-home proofing box. … this dough is about half as big as my cat. I dunno. I don’t have much else to compare the dough… or the cat to. Which set will you make doughnuts out of? Left… choose the one on the left. This might be my favorite part of the process…. After this cute part comes the frying. No photography around hot oil please. It’s enough for me to not totally burn my hand just cooking the doughnuts. Let’s not put a camera in the mix. If this beautiful, golden doughnut isn’t enough to make you love your living… I just don’t know what else to tell you. Dip it is sugared pink… maybe that will help with the love. Homemade doughnuts are undeniably perfect. 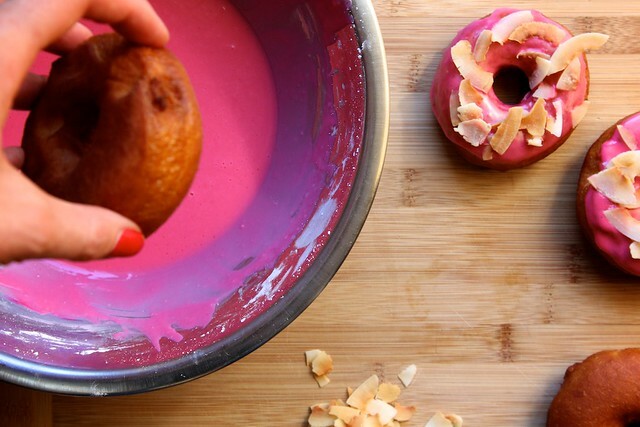 These doughnuts are a play on the traditional cake doughnut, frosted pink and decorated with snow white coconut. This version is slightly more neon and toasted, making is rustic cool. 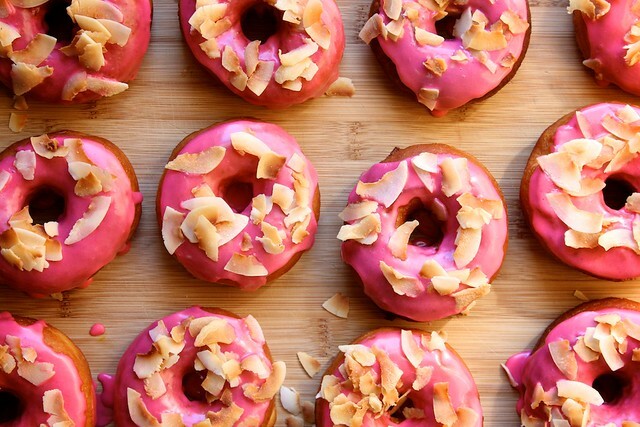 This recipe is from my favorite doughnut shop in Seattle, Top Pot. They’re cookbook Hand-Forged Doughnuts totally has my mouth watering. These people are not kidding around when it comes to doughnut land. More photos of this recipe, along with an incredible Chocolate Cream Pie recipe can be found on The Chalkboard Mag. This site is stellar. Trust. 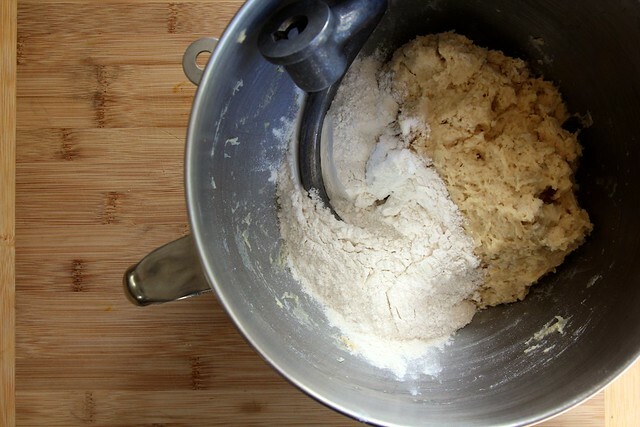 In the bowl of an electric stand mixer, whisk together the yeast, water, and 1 tablespoon of sugar. Let stand for 5 minutes until mixture is foamy and frothy. That’s how you know the yeast is alive and ready to doughnut! 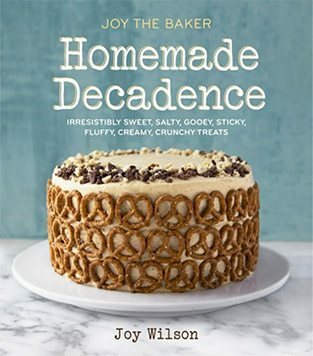 In a large bowl, whisk together sugar, baking powder, nutmeg, salt, and 4 cups of bread flour. Set aside. Break up shortening and add to the yeast mixture. Add the egg yolks, and vanilla extract and beat on low speed using the paddle attachment. This will deflate the yeast bubbles and help break up the shortening. With the mixture on low speed, add one third of the dry ingredients. Blend until flour disappears. Add another third of the dry ingredients. Beat until flour disappears. Switch to the dough hook and add the last amount of flour. Mix on low speed until no flour bits remain. Add a bit more flour if necessary. 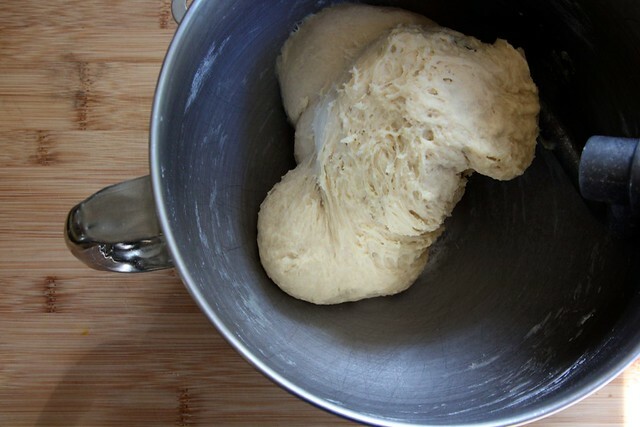 The dough should clean the sides of the bowl, and not stick to the bottom in a pool. Knead for 2 minutes. The dough will be glossy, and just a bit sticky… but it shouldn’t stick to your hands. Transfer the dough to a baking sheet that has been sprinkled with 1 tablespoon of flour. 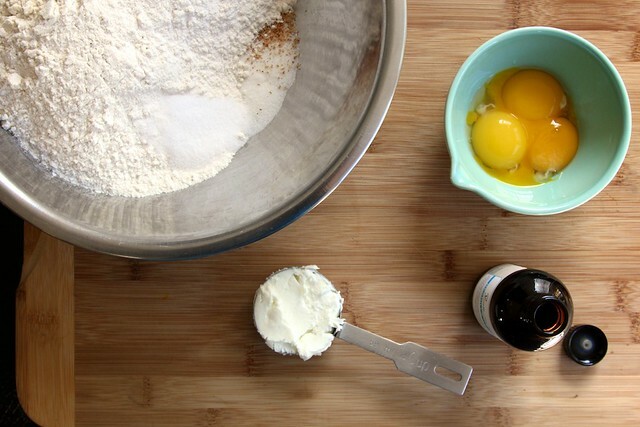 Shake into a 6-inch circle and dust the top with flour. Cover with a dishtowel and set in a warm place to double in size. The Top Pot Cookbook has an awesome way to create your own proofing box! Bring a large kettle of water to a boil. Pour about 8 cups of water into a large baking dish. Set it on the floor of your oven. Place the sheet tray with covered dough on the middle rack above the steaming water, close the oven door and let rise for about 1 hour. 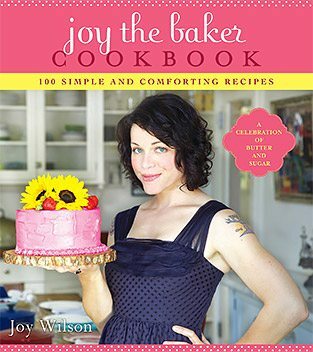 Transfer the dough to a lightly floured work surface and roll out into a roughly 12-inch circle, about ½ inch thick. 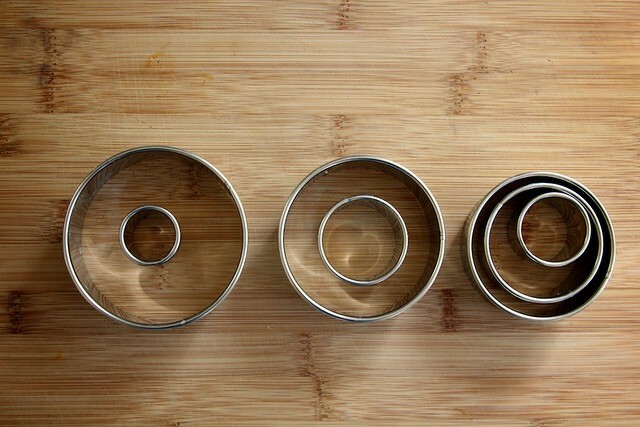 Cut into 12 doughnuts and 12 holes using a 2 ¾-inch and 1 ¼-inch round cutter. 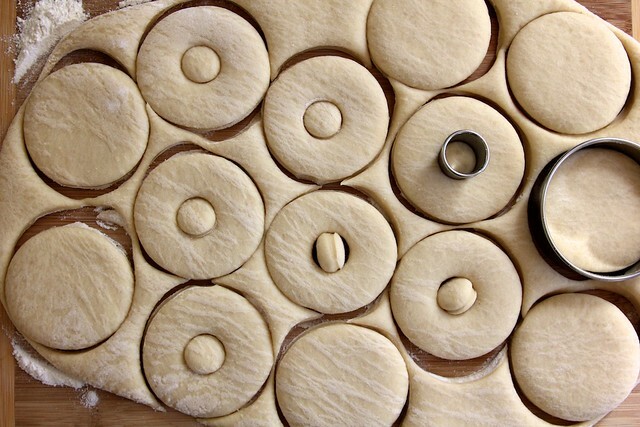 Gently transfer the doughnuts and holes to two baking sheets that have been sprinkled with flour. Set the doughnuts for their second rise about 2 inches apart. Let rise in the oven for another 30-45 minutes, using another hot water proofing bath. In a medium or large, heavy-bottom saucepan, heat canola oil that is 2-inches deep. Use a candy thermometer to bring the oil to 350 degrees F.
When the doughnuts have doubled in size place a few doughnuts into the oil to fry. Don’t overcrowd the pan. Fry for 30 seconds on one side, flip and cook for another 30 seconds. Doughnuts will darken slightly as they cool, so don’t cook them too dark. Transfer to a few layers of paper towel to cool. Bring the fry oil back to 350 degrees F before frying new batches of doughnuts. Place the sugar, corn syrup, salt, and vanilla in a large mixing bowl. Add the food coloring and hot water and use a whisk to incorporate. Blend until entirely smooth. If the mixture seems to thick to easily dip doughnuts, add more hot water 1 teaspoon at a time. To ice the doughnuts, dip one side of the cooled doughnuts into the freshly made icing. Sprinkle with toasted coconut. Let dry and set for 10 to 15 minutes before serving. I don’t normally go in for cutesy pink Valentine’s Day stuff, but I LOVE these (ok, so maybe I do go in for all the pink stuff)… Anyway, yum. And wow. Awesome post. Those look like little rings o’ love if I ever saw one…or several? Oh, Joy! These doughnuts look absolutely perfect! I could use a REALLY good tasting doughnut right now with a nice, tall cup of java. I’ve never had one with coconut of top, and I LOVE how you used the flakes and not shredde. It just looks so pretty! You’ve officially caught my attention. Stopped me dead in my tracks. As if Top Pot wasn’t enough to get me. You had to go and dye them pink. I love you. My thighs hate you. It’s complicated. OK WOW – these are now on my mental list of things that i love! you know, that and life…which, as you said maybe cheesy, but it’s so true! donut… how we used to have it as a kid is with lots of buttercream and chocolate sprinkles. gulp!! now i want some! I love that you don’t need a donut pan for these! My dad used to take my sister and I to the doughnut shop every Saturday morning. We’d go before they opened and watch the bakers making them from a little window at the front of the shop. When they finally opened, my sister and I got to pick out two doughnuts. I always got a pink cake doughnut. These looks exactly like the ones I ate as a kid (with a grown up twist of coconut…yum). Thanks for bringing back a wonderful memory. And you are right…there’s no better way to spread love than with doughnuts! These look uhh-maaaaazing! WOW. Love the sprinkling of coconut.. absolutely delicious! All I can think about right now is how much I want a pretty pink doughnut. This looks like a perfect way to share the love.